When asked why they continue to be friends, Sara Azzuni and Nimoy Vaidya, both seniors at Goshen College, responded with mock confusion. “We’re just stuck at this point,” said Azzuni. Despite their banter, Azzuni and Vaidya showed that their friendship means something more than coincidence to them. 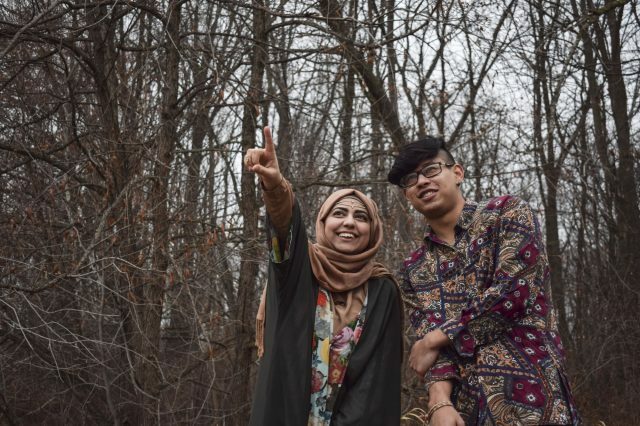 They built it through smooth and rough patches at Goshen College, as both have persevered through academic pursuits and experienced living in a foreign country. Both have been well-known leaders on campus and active in many circles throughout their time at GC. Azzuni, a nursing major, has worked on the Campus Activities Council and for the Admissions department. Vaidya, a business major, has served in various Residence Life roles and is known for his b-boy dance performances. Both of them have been leaders for the International Student Club (ISC), which they credit as one of the foundations of their friendship. Azzuni and Vaidya could look back and see that it wasn’t always obvious that they would become friends, though they happened to know about each other while still living halfway around the world. International students are assigned to “orientation guides.” These are older students who contact them before they get to campus to give them information and accompany them once they arrive. Azzuni and Vaidya had the same orientation guide. The two met on the first day they arrived in Goshen: Azzuni from Dubai, United Arab Emirates, and Vaidya from Kathmandu, Nepal. Azzuni remembered being impressed with how much better Vaidya’s English seemed in comparison to hers. This led to some initial confusion. When Vaidya asked Azzuni if she considered herself an extrovert or an introvert, she responded by saying, “The second one.” Vaidya remembered being confused and decided not to ask more questions. Any breaches in communication didn’t prove to be disastrous, and the two international students became good friends. And while the pair didn’t see each other a lot outside of their shared ICC class, they began to bond the summer after their freshman year. Both of them stayed on campus to work, with Azzuni in Admissions and Vaidya at the Welcome Center. Like other international students and student workers, they lived in the Coffman Residence Hall. They often cooked together, and Vaidya helped Azzuni study for a physics exam. Azzuni recalled how Vaidya had just gotten a new Xbox at the time and that they had played a lot of FIFA, a soccer video game. The two have relied frequently on each other as fellow international students. Vaidya explained his appreciation for Azzuni giving him good life advice. He also cited one crucial instance when she helped him find crucial information about getting a visa and faxed it to him at the last minute so that Vaidya could go on a May Term trip to Spain. Nonetheless, the friends have also had cultural differences that have shaped their relationship. In adherence to her Islamic faith, Azzuni prefers not to touch males, which Vaidya has developed methods of responding to. He gives Azzuni air high-fives and handshakes. When they take pictures together, he hovers his arms around her. Azzuni believes that the challenges she has faced during her time at GC made relying on others necessary, especially as an international student. She also respects his leadership in his role for ISC. “[Vaidya has been] one of the few guys on campus that I would go to if I need help on something,” she said. The two intend to keep in touch after graduating, and they one day hope to visit each other’s home countries.